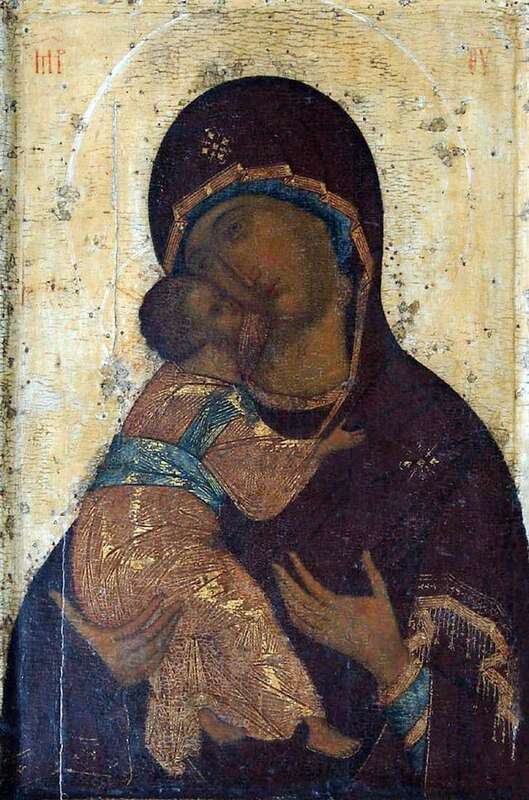 The well-known painting “The Virgin of Vladimir” was created by Rev. Andrei Rublev in 1406. The painting depicts the Mother of God, which holds the child tightly to her. The baby is sitting on the mother’s right hand. The son, loving, hugged the mother for the neck. This is jesus. His right hand stretches forward to his native maternal shoulder. The child has innocent, wide-open eyes. On the left hand of the woman some kind of washings are visible. There is an assumption that initially the background in the icon was golden in color, like gold. The contours of the halo were white. Over time, the colors faded, faded and became faded. This is the most revered icon of the Virgin Mary by the Russian people. It refers to the so-called. type “caressing”. The image of a loving mother and her carefree, still very young son appear before the viewer. Mother still does not know what she will have to go through and in what agony her blood will die. It will be later: torments, death, resurrection. In the meantime, she strongly pulls her son to her and tries to protect him from all adversity. He is still too small to understand that the world around him is cruel and vain. This is the most lyrical story in the history of iconography. These 2 images can be interpreted differently. The icon may embody a theological idea. The Virgin Mary in this case acts as a human soul that communicates closely with God. This icon is honored as miraculous. It is said that the water with which the icon was washed becomes healing and can cure the incurable patients. This shrine always takes part in important events of its state. There is a tradition that it was originally written by Saint Luke. Then its copies were created. The icon traveled for a long time. And in 1408 in Vladimir A. Rublev left an exact list of icons. Experts suggest that the original was created in the 12th century. It is believed that this work is two-sided: one side shows the gentle and sweet image of the Virgin and Jesus, the second is the opposite – the throne and the instrument of the Passion of Christ.